 All the advantages of COAX with 110 ohm balanced patches.  Longer cable runs with less distortion. 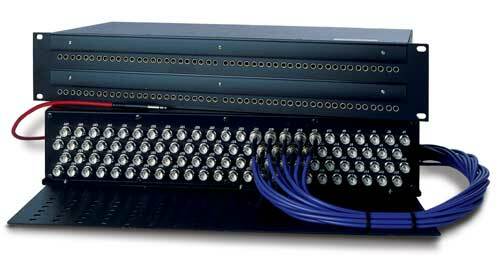  Cost effective compared to a 2X24 video patchbay (for patching digital audio) and 48 external baluns (for converting 110 ohm to 75 ohm).  Uses standard 110 ohm MINI/TT/Bantam audio patch cords.  Uses standard BNC connectors on the rear of the unit. 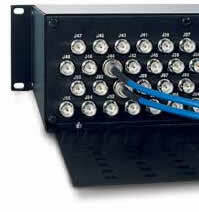  Rear cabling tray for bundling and organizing all coax feeds.  Large 4-line designation strips on the front panel for labeling.  Patch directly between 110 ohm patchbays. Each jack has a built-in balun to match the 75 ohm unbalanced coaxial cable to the balanced 110 ohm jack. flexibility for cabling your digital audio facility. 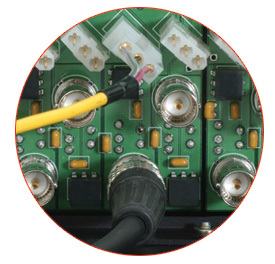 benefits of coax cable with the flexibility of patching between other 110 ohm patchbays.